Technology Options for Special Needs reviews this free, AllAcess app that supports VoiceOver for access. Thank you to Technology Options for Special Needs for reviewing this app. I often use Siri to locate some restaurants nearby when I visit different locations. However, I was always wondering if there is a better app for VoiceOver users. The app called All Access offers the information about not only Food & Drink but also different categories such as Health & Services, Auto & Travel, Shopping, Scan codes, and more. So I tried this app using the VoiceOver. It is very easy to navigate. For example, from the Food/Drink button, when you select restaurants’ types (i.e. Asian, American, All Types, etc.) 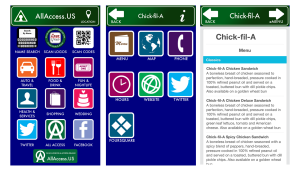 and select your choice of a restaurant, you can access the information from separate buttons such as the restaurant’s Menu, Maps, phone, specials, and hours, all of which can be read aloud. This is helpful for everyone because you sometimes cannot read the Menu easily from their website.